bl.uk > Online Gallery Home	> Online exhibitions	> Asia, Pacific and Africa Collections	> Jullunder Doab: Kote Kangra. Plate 2 from "Recollections of India. Part 2. Kashmir and the Alpine Punjab" by James Duffield Harding (1797-1863) after Charles Stewart Hardinge (1822-1894), the eldest son of the first Viscount Hardinge, the Governor General. 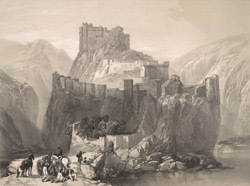 The fort depicted, Kote Kangra, was in Sikh possession until it became the property of the British Government by the Treaty of Lahore, March 1846, after the First Anglo-Sikh War. The territory of Kashmir occupied an important position in the political geography of India as the British needed a friendly power by which the Northwest frontier could be defended against the Afghans.